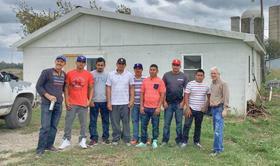 The workers came from Mexico under the H2A visa program, which allows foreign nationals to enter the U.S. for temporary or seasonal farm work. The Department of Labor program also sets a minimum wage for the workers and requires the employer to provide for costs associated with the work, such as work supplies and travel to and from the farm. But striking worker Francisco Gonazalez said he and his coworkers did not receive a large portion of the wages, reimbursements, and equipment they were guaranteed. The workers had support from the Farm Labor Organizing Committee, a union that has represented migrant workers on the H2A visa program. Field organizer Stephen Bartlett said the seven workers have received a settlement totaling $20,000. After legal fees, that covers about half of what the workers say they were owed. “It was a good win for them to be able to come home with money for their families, and for the union to show our presence here in Kentucky and the organizing that we’re doing,” Bartlett said. The union has been active for years in Ohio and the Carolinas, but just began organizing in Kentucky earlier this year. Their work is part of a growing effort to unionize migrant and immigrant workers throughout the United States.